A Kabuki troupe returns to a village to put on a play. The leader of the troupe has some ancient history in that village, visits his old flame and his son who has been under the impression that his father had died when he was a baby so he is not demeaned by having an actor for a father. It all goes wrong. After the perfect Tokyo Monogatari by Ozu that we had on this list a while ago any film by him would have a hard time living up to the expectation. That was partly what happened but then this just is not as great as Tokyo Monogatari. That being said it is still a pretty good film, as in most good Japanese cinema of this time it is unflinching in its portrayal of daily life as an unrelentingly depressing affair. Ozu's very still camera continues to help to reinforce that sense of boredom. The story was not so compelling however, it would have helped to have fleshed out the characters more deeply so we as an audience could care more about their fate. This being said there are moments of truly beautiful imagery, and it is still a film worth seeing, even if you want an Ozu film I would still go with Tokyo Monogatari every day. Early on, there is a travelling shot filmed from a ferry as it docks at the harbour. 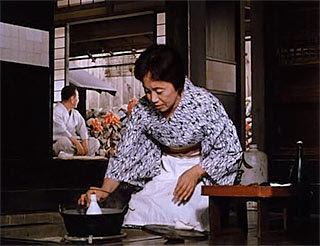 This is the only instance of camera movement in Ozu's six colour films. The thing I like about the Ozu movies I've seen is that I spent half the film confused as to why exactly I was watching the thing, but by the end everything had somehow fallen into place and I felt the saddest I had been in a considerable while. I like being snuck-up on.